Market, sales, and so much more! Good Morning friends! I just had to write about the Pickin’ At The Ranch sale that I hosted at my ranch last Saturday along with my friends Savannah with the Vintage Rose, and Nancy with Fireside Bakeshop. Let me back up a little and tell you why I decided to do this sale and how it turned into a bigger deal than I ever intended. I held a yard sale at my ranch in July and it was a shockingly huge success! I had so much fun that day and people absolutely loved being at the ranch with the fresh air, farm animals, and beautiful scenery. I had compliments all day long on how beautiful it is here, and it is. We are blessed to call this our home and we wake up every single day in awe that this is our reality. We have worked so hard in our lifetimes to make this life of ours a reality. You have no idea, but maybe someday I’ll talk about that story of where we came from and how we ended up here. Anyhow, I wanted to let others come out and experience what we do on a daily basis, if even for a few hours. Luckily, Savannah and Nancy agreed to join me with their wares! I mean, who doesn’t love great repurposed furniture, handmade signs, and hand crafted s’mores? They were the perfect complement to all my rusty, galvanized, metal, wool, and flannel dreams! I told the other 2 ladies that obviously 1.4 thousand people will not be coming out but even if we have 5% of that, we will have a very busy day so prepare well! And then….KOTA Territory news came a calling and well, I couldn’t pass that up but I again thought to myself, “I will not have enough inventory for people!” I lost sleep over this deranged thinking for 2 nights! I never want people to be disappointed in an event that I host. So, finally I started praying, and I mean praying hard and guess what? It all worked out just fine! There is a bible verse that talks about worrying less and praying more, well, I go back to that verse a lot and for me, it works!!! The sale was a tremendous hit! The weather was absolutely perfect that day! The animals were all on their best behavior…well almost. Robert the Icelandic Sheep was having the time of his life schmoozing with all the ladies but then decided Nancy’s s’mores and her signs looked appetizing. Even after being put in his pasture, people still enjoyed seeing the sheep and taking their pictures with them. People enjoyed the shopping, they enjoyed the peaceful setting, they enjoyed the animals, and some even commented on how they loved the smell of the cow manure as it brought back good memories of their childhood at their grandparent’s ranches or even their own. This is what it’s all about for me! I want people to experience something out of their ordinary. I want people to know that if they dream big, their dreams will become a reality if they put in the work. I want children to run and play and laugh and giggle. There was this sweet little family who shopped with their young children then went over and were looking at the sheep. When they were finished and were leaving, their little girl, who was probably 4 or 5 was running, s’mores pop in hand, and turned around and yelled to her parent’s, “Oh and Mom, thanks for buying me this s’mores pop!” It melted my heart and they were totally unaware that I had just witnessed that sweet, memory making moment in all their lives! Memory making, that’s what it’s all about and I’m happy to be a small part of that! I know Kountry Junkin’ has given me the most amazing memories the past 6 years and I look forward to even more going forward! 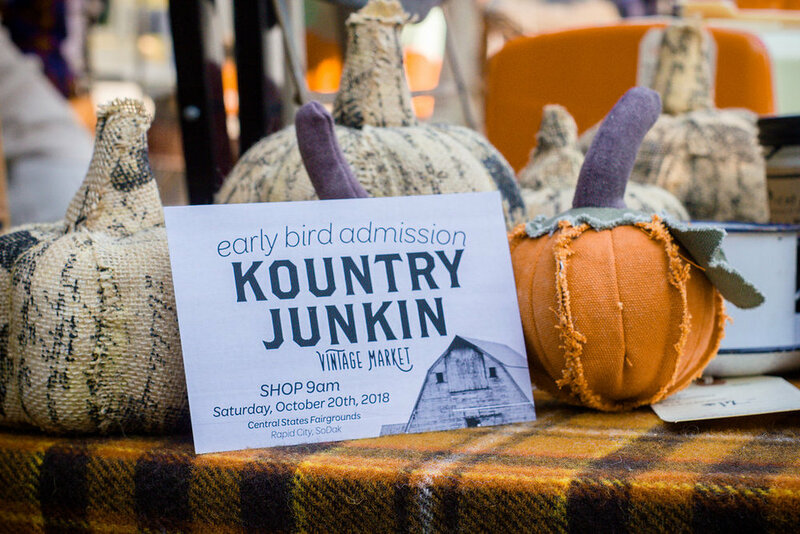 There are BIG things coming for Kountry Junkin’ in 2019, and I mean BIG!!! I’m hoping that by the end of October we will finally be able to announce to the world what our plans are! In the meantime please make plans on attending the next BIG event which is the fall market! The fall market is scheduled for Saturday October 20th from 10am-4pm. You will find us at the fairgrounds in Rapid City in the big Events Center Building. We have also been contacted by Sutton Rodeo Group and have agreed to host a Junkin’ Market during the busiest weekend of the Stock Show February 1stand 2ndat Ice Arena in the Civic Center in Rapid City, SD! So, put that on your calendars as well! Thank you all for sharing your day with us and I look forward to sharing many, many more memory making events with you in the future!